Goodbye Mysore-But we’ve only just arrived!!!! 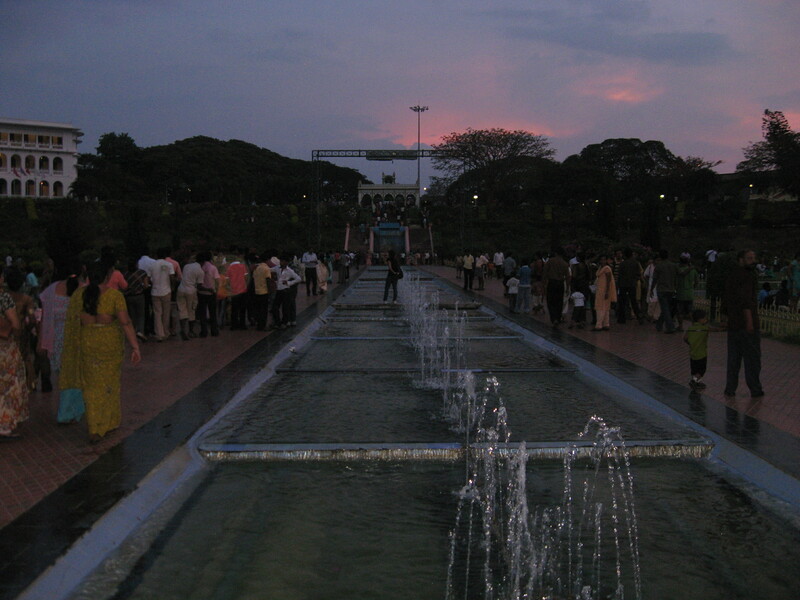 19th April 2010, Mysore, Karnataka India. 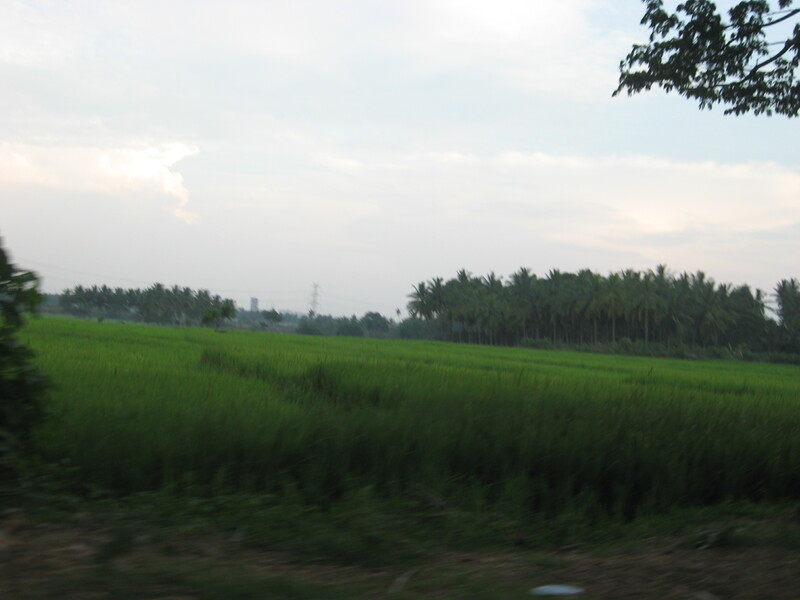 The day dawned bright and clear when we were to leave from Mysore and proceed towards Bangalore. I guess there was a transition when we started out with villages and then made our way to towns and to cities and finally landed to Mumbai. Well we started our day with some Saree shopping. 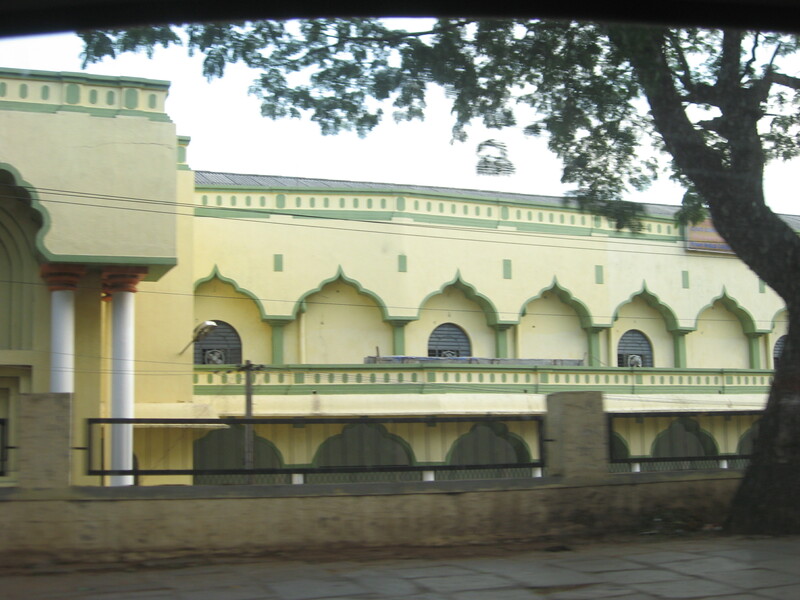 Mysore is famous for its sarees. Since we were to leave early when we went to search for the shops, none of them were open. I guess Mumbaiites are so used to the fast paced life, that w expect shops open as early as 8 and open till 11 at night or even later.So consequently any small city is a slow and sleepy place for us. But it feels very nice not having to rush against the crowd to catch that 9:36 Ladies Special or run for that irregular bus. Finally we found one shop which was open. So we went inside and asked the shopkeeper for something ‘different’ which was not very loud and audacious. After lots of sarees and rejections later we settled for a few and then bargained our way to get a good deal. The shopkeeper had a lot of currency notes which he had framed near the entrance. I really felt like negotiating and taking some of the notes. After that we made our way to the Government silk factory. Here you could also go into the factory and see how the sarees were made. There was also a shop where you could buy sarees. But the sarees here were extremely pricey (=silk sarees authentic and govt recognised=sky high prices) i’m sure the sarees must have been nice but since we(=me,mum n my sister) don’t have many occasions to wear sarees, spending so much was out of question. Next we decided to pick up some sweets. 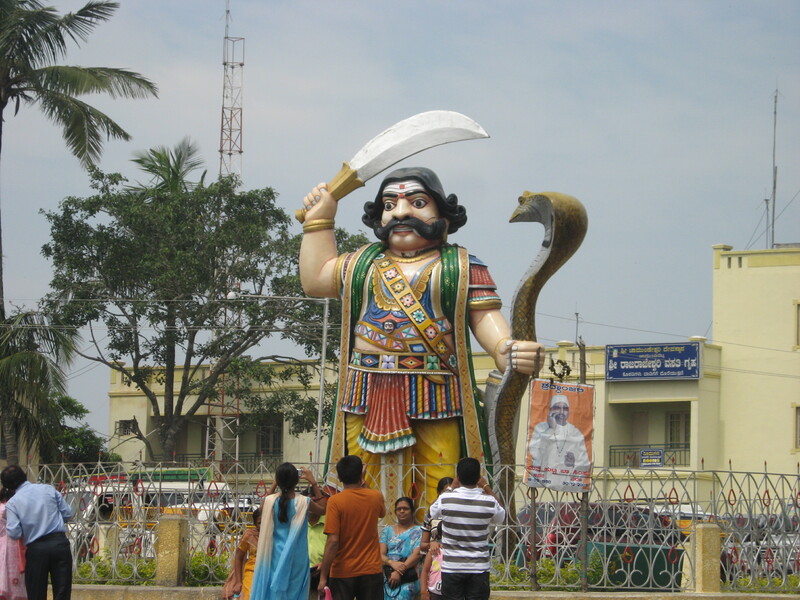 Mysore is also famous for its sweets. We knew this from prior knowledge. There was this shop we’d seen in the show ‘Highway on My Plate’ hosted by ‘Rocky and Mayur’. I absolutely love watching that show i mean whenever i’m watching it i’m envying their job. Eating and only Eating!!! But the best part is that they give very honest opinions about the food and the ‘Must Haves’ plus they look like foodies not like those half starved models that come and pretend to eat and take minuscule bites. 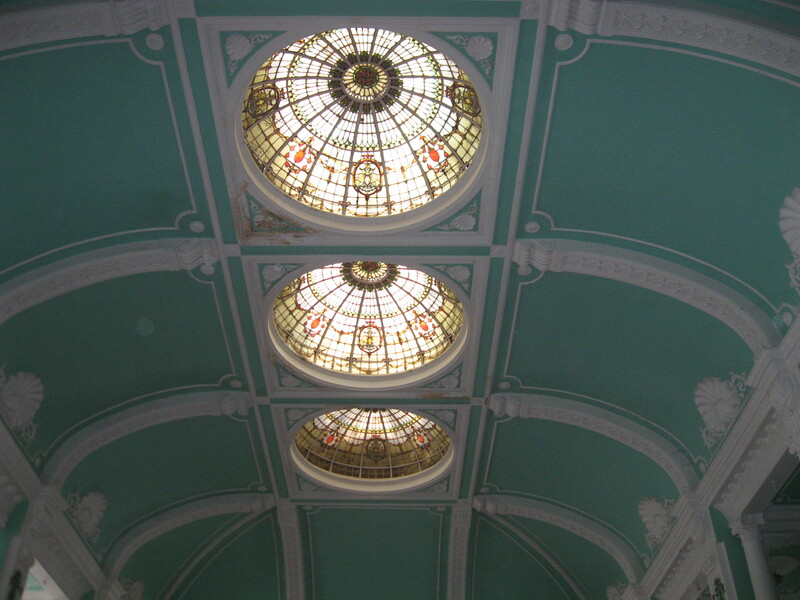 A word of caution, there are as many as 3-4 Bombay Tiffany’s in the boulevard where these shops are located. But finally we found one which Rocky n Mayur visited. We also asked them about this and they said they had just opened shop when they came along camera et al. Without any prior warning!!! So we left with a lot of Mysore Paa which is besan and sugar mixed in Pure Ghee. You can make the difference when you eat, pure ghee has a satiety no other substitute has, We also picked up a mithai that tasted like chocolate fudge. 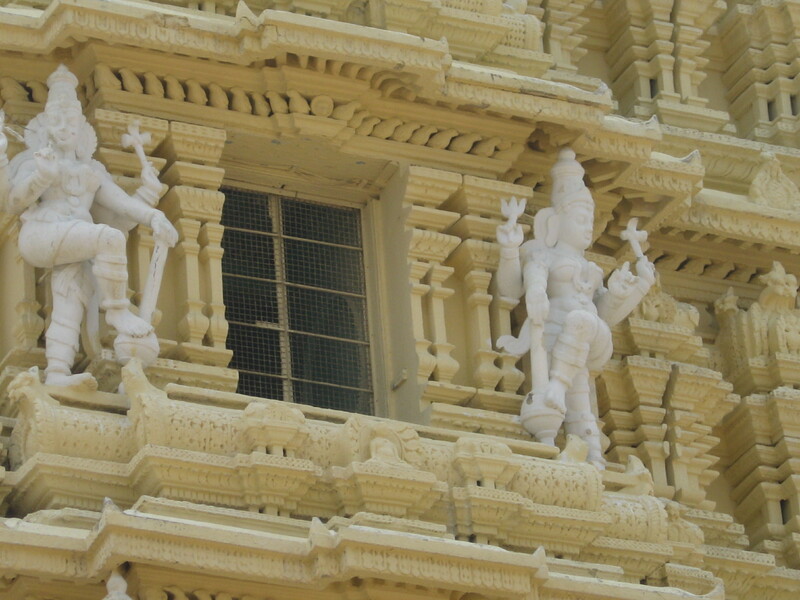 During that time, my dad was busy solving the rubix that we picked up when we went to the Chamundeshwari temple. He got one side right. After that we left for Bnagalore. We’d heard that the next roop of Satya Sai Baba was going to be born somewhere in Srirangapatnam a few kms off Bangalore. So we decided to stop there. There was one place where they had put up a sign with Baba’s picture on it but it turned out that it was only a school managed by the trust. 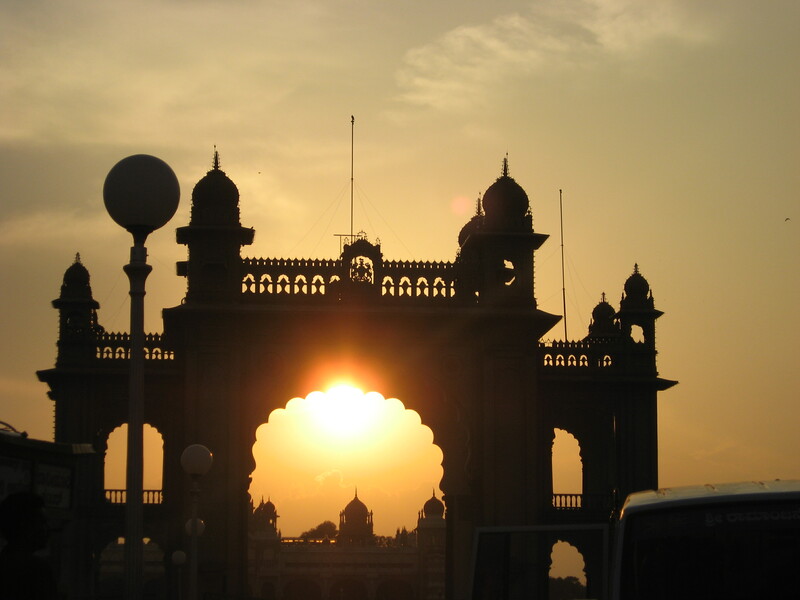 Although we spent less time in Mysore, the city made an everlasting impact on our minds. 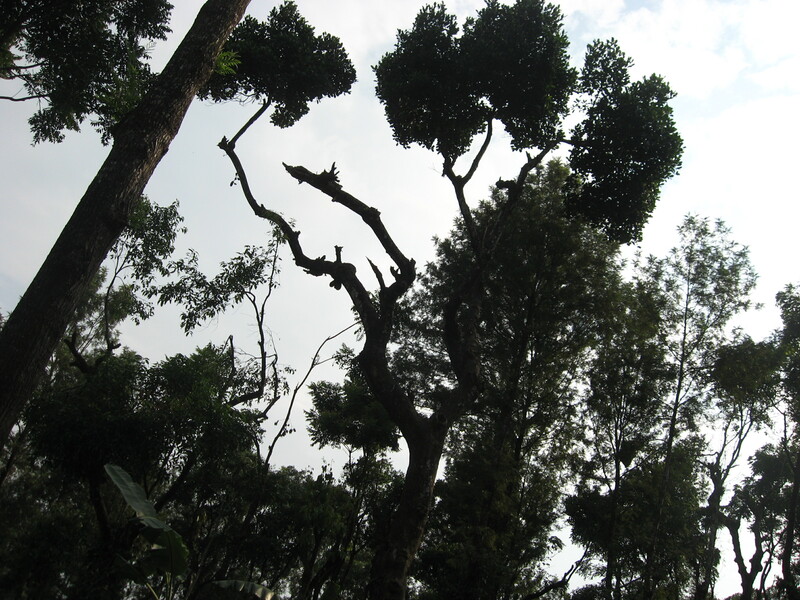 The canopy of trees on every road, the ease of travel, the many palaces so very well maintained, definitely made us want to come again!!!! Author NMPosted on March 11, 2012 Categories Karnataka Road TripTags Bargain, Currency, Delicacy, Expensive, fast paced life, Foodie, Fun, Goodbye, India, Karnataka, karnataka india, Leaving, Mysore, Road Trip, Saree, saree shopping, Shopping, Silk, silk sarees, Sweets, Travel, Travel Writing, vacationLeave a comment on Goodbye Mysore-But we’ve only just arrived!!!! 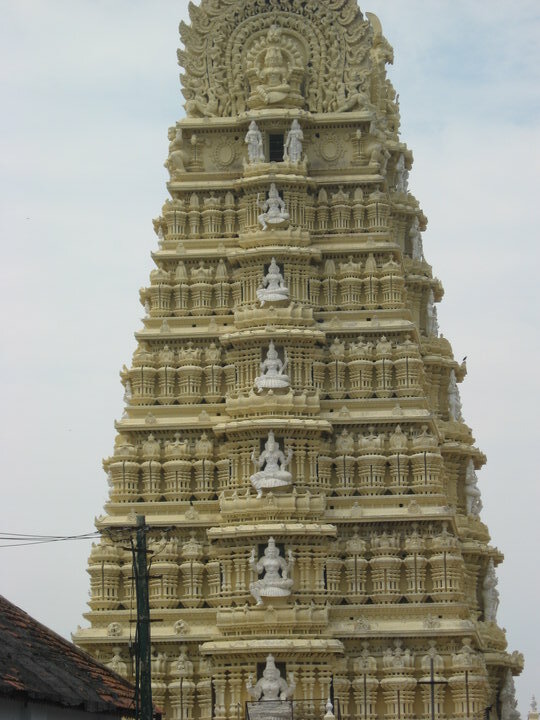 Exploring Mysore-A trip in the colonial times. Today we decided to explore Mysore. Our first stop was breakfast at the hotel where we were staying. Like always the breakfast menu was the same (=Sada dose, Set dosa, Masala dosa and the like). 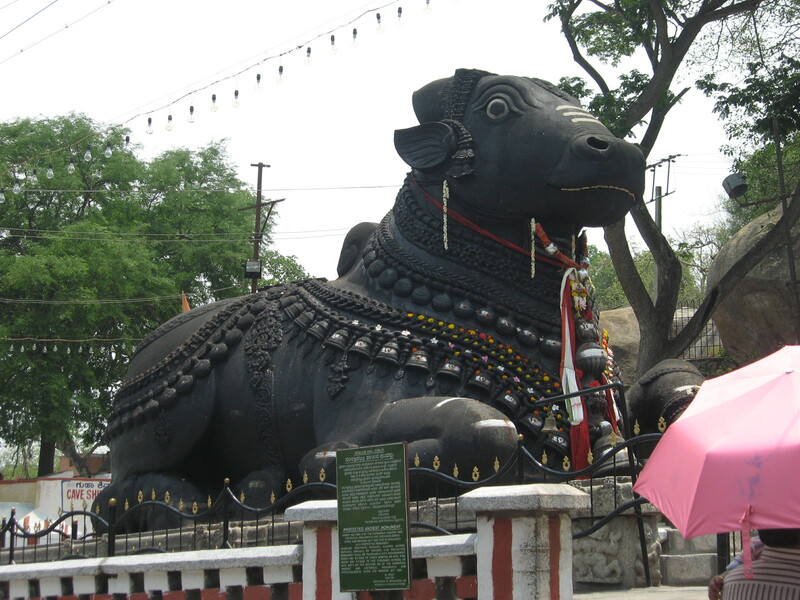 After that,we went off to the Chamundeshwari temple which was on top of a hill. We had to navigate a bit and ask people for directions but we ultimately made it alright there.There was a welcome gate like all other dwars we had seen all along our journey. 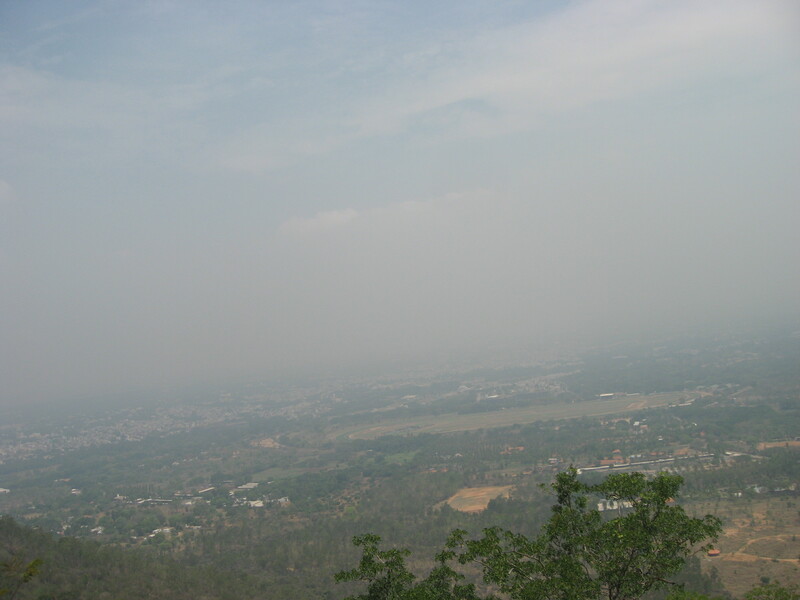 There were signs at corners which told us to enjoy the views of Mysore seen from above the hill. 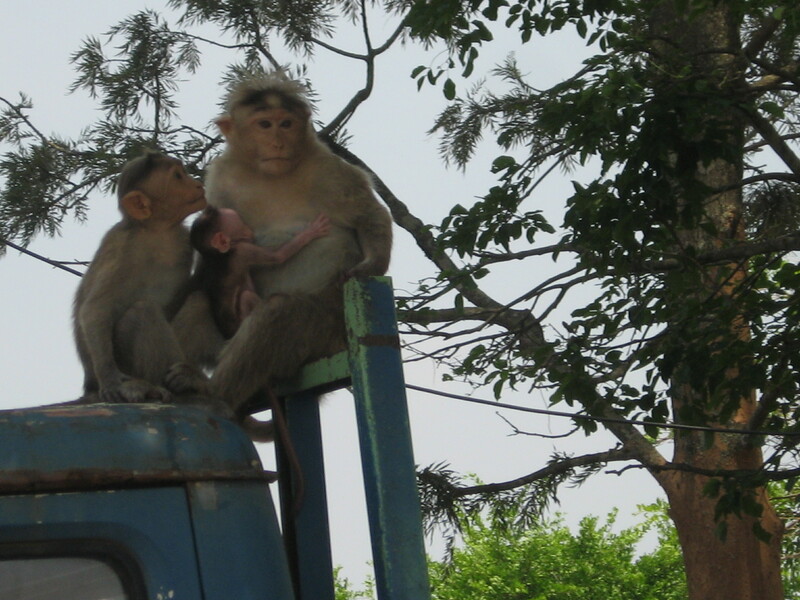 There were also a lot of monkeys on the trees with some mothers holding their babies. 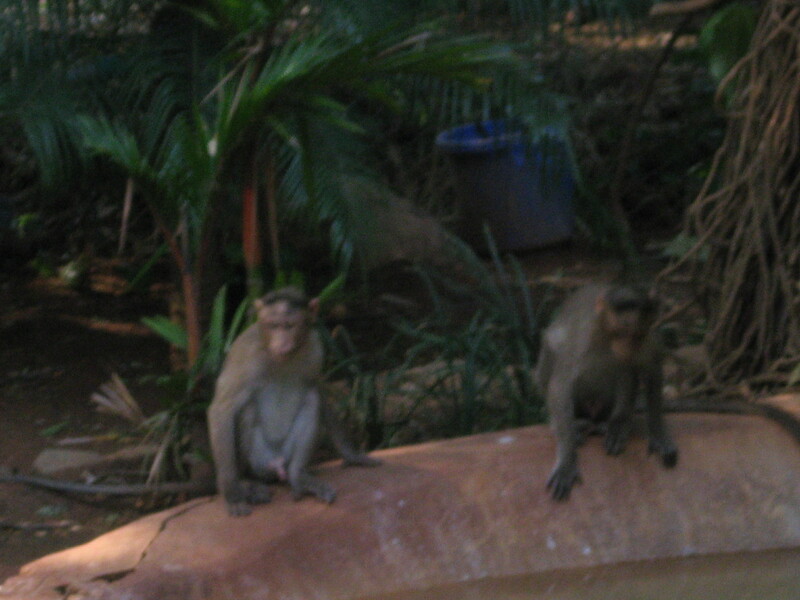 Although i find adult monkeys repulsive, the babies are rather cute and pink. 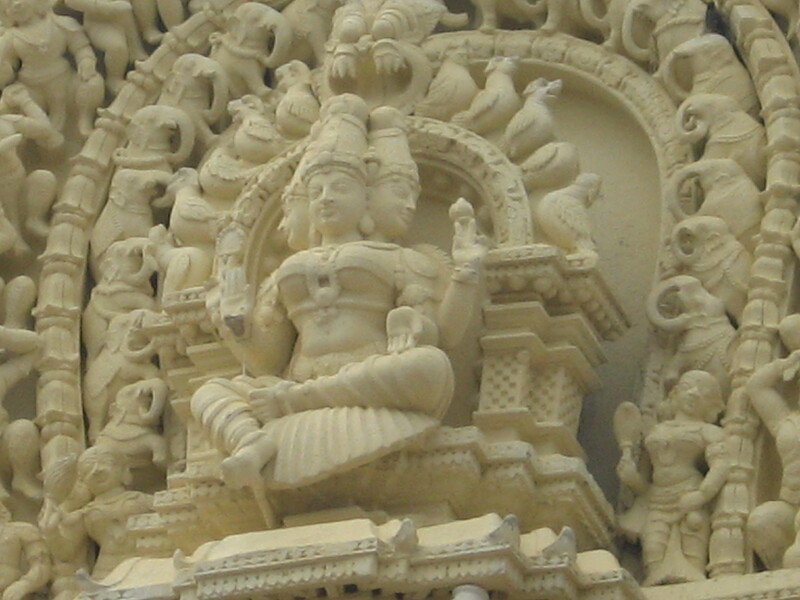 The Chamundeshwari temple was beautifully carved and had intricate work done. There were different levels with different idols of gods and goddesses. But much to our chagrin, there was a huge huge line encircling the temple. We certainly had picked a wrong day to come here, a Sunday. But have no fear, the temple authorities are here. There is a provision for people who want to see the temple quickly, of course you have to cough up money for that, 100 bucks a person. 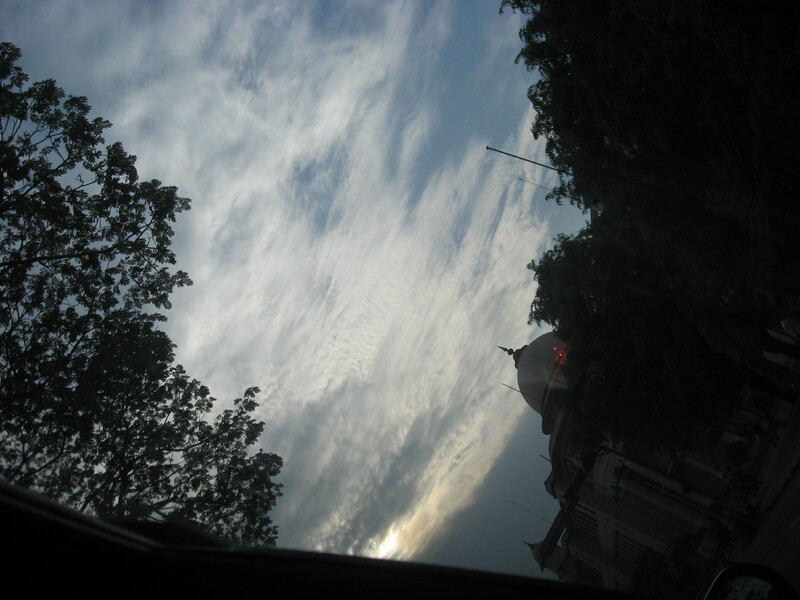 That goes to the temple for its upkeep(i hope) and the impatient devotees can see the temple fast. We did just that. As luck would have it, we were just in time for the Aarti. We got a quick darshan of the devi and then went to another small idol where the bhatmam handed us the most fragrant and sweet smelling kumkum i’ve ever smelt. 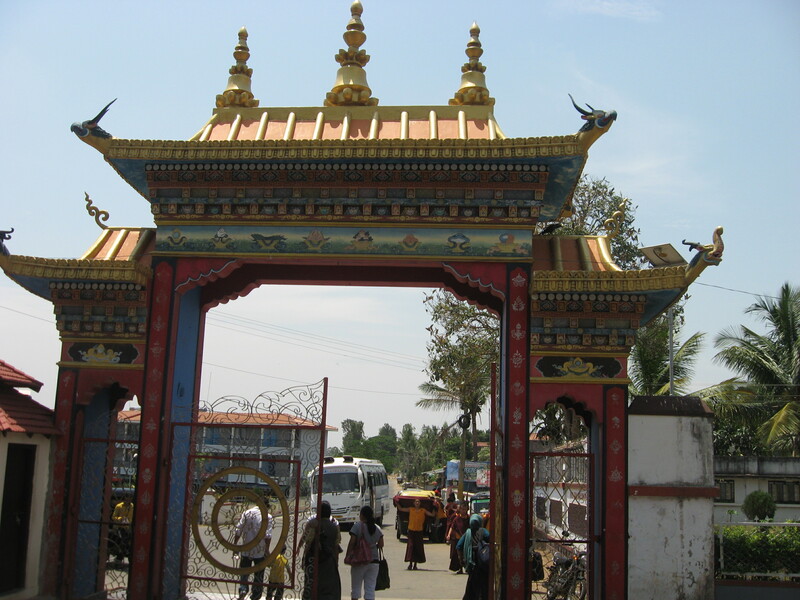 Then after a round of the temple complex, we headed out. 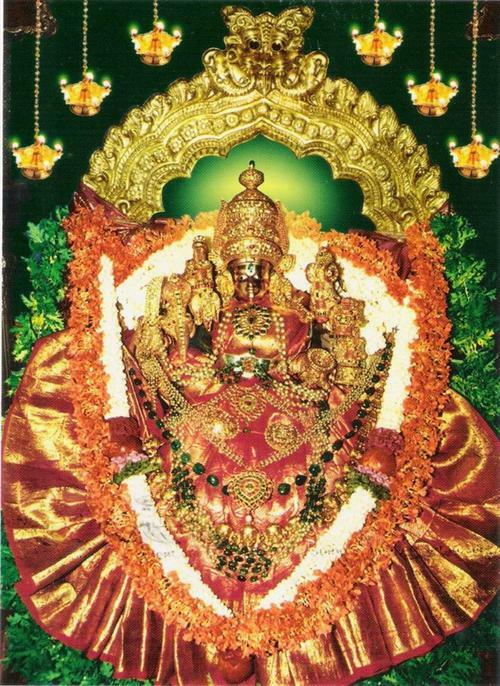 At the time we got the darshan, another bhatmam handed us a garland (=just our luck!!). 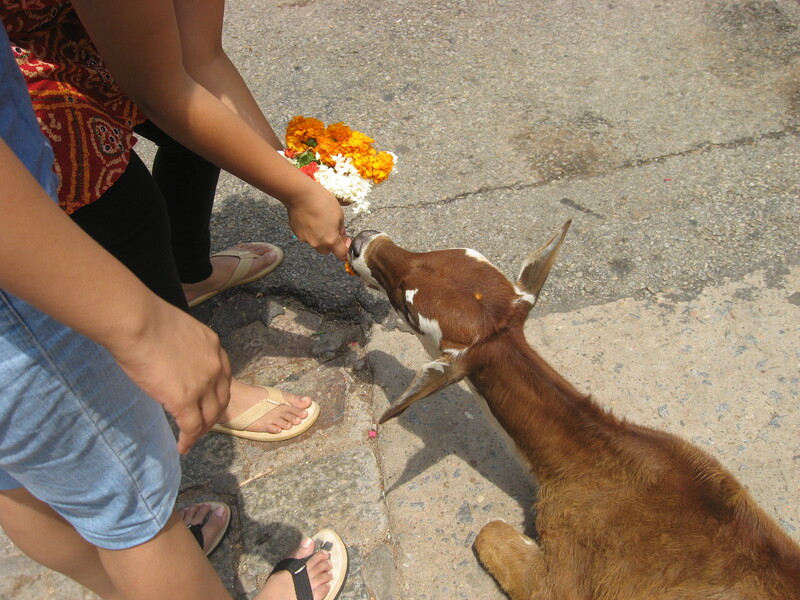 Since we couldn’t keep it anywhere, we fed the leaves and flowers to one of the calves sitting outside. Its cute, when you hold it near their nose, they smell it, come close to you and then eat it. they might even lick you!! Its very sweet. Then we decided to head out to the Lalita Mahal Palace. 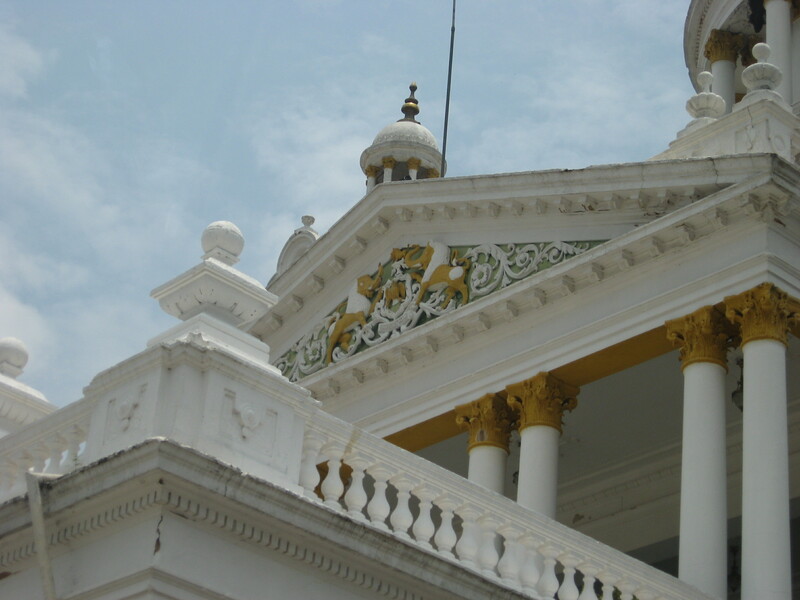 The Lalita Mahal is the second largest palace in Mysore and is situated near the Chamundi hills (=wikipedia’d this bit). We decided to check the place out. And then we found out that we could explore the inside of the palace too but we had to buy entry tickets (=Rs 250 per head). This was a summer palace for the Queen and is now a hotel. Its a really good thing that most palaces are converted into hotels. 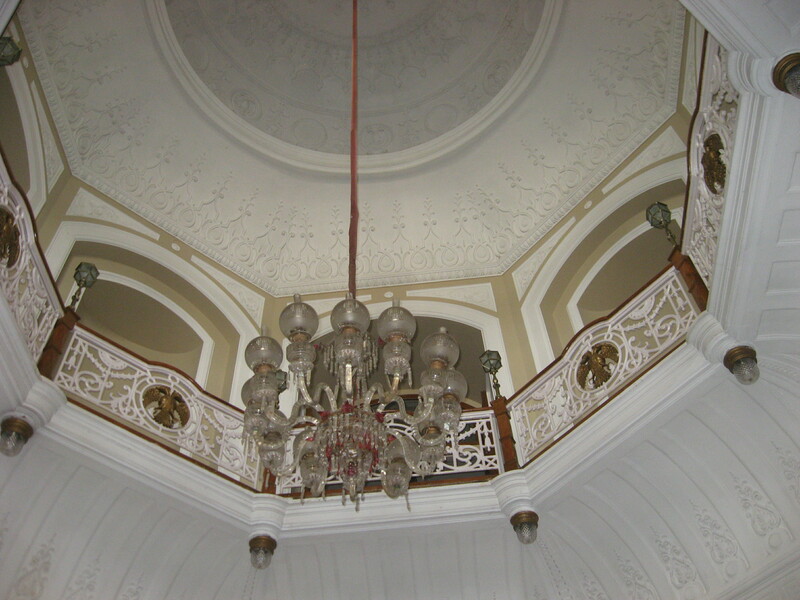 Not only does it attract foreign tourists, but it also preserves the palace. 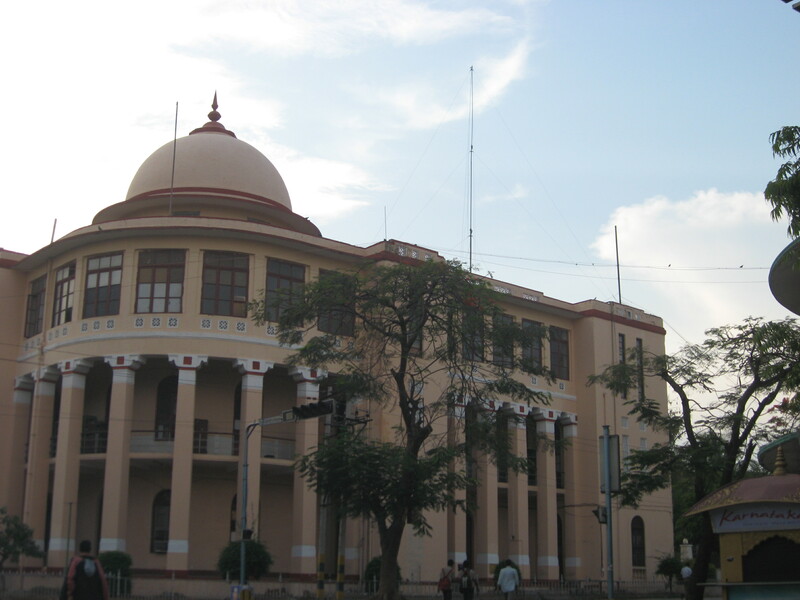 The Lalita Mahal Palace is the only palace i know to be built entirely of WOOD. yes hard to believe but its true!! Its built of wood and done and preserved very well. 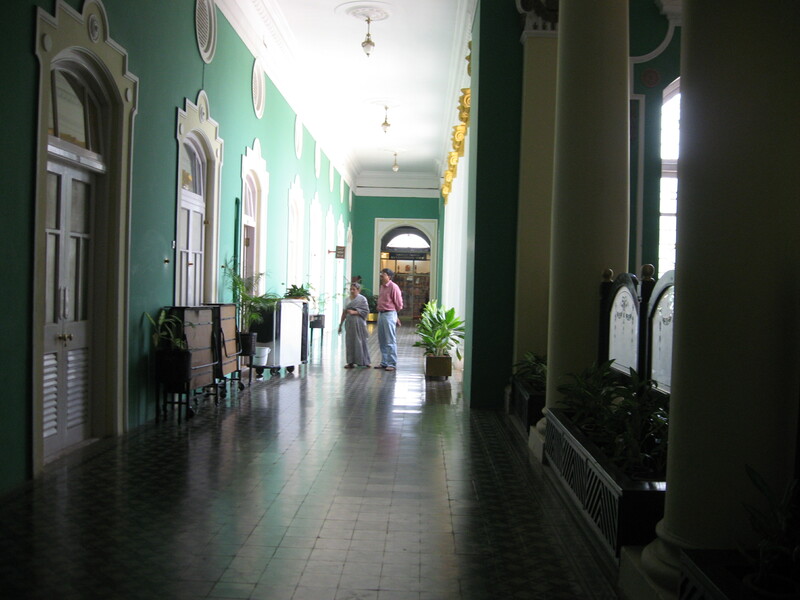 Once we got the tickets, the guard at the palace led us into a corridor and served us tea. (=i had tea everyone else had coffee! !It was elaichi tea yummy!!) We spoke with one of the men who took care of the souvenir shop and he said that the current CM of Karnataka was doing a very good job. Every year it seems a sum of 1 crore (=yeah i know) was allocated to every village for the development and for celebration of festivals (=smart since festivals will spur the domestic economy and stimulate demand in the village for a lot of commodities). Also the BJP had a super big majority. Anyway, we saw some people from the Orient coming(=either they are chinese o japanese i can’t appear prejudiced i just didnt know which country they came from). Discovery:The lift at the Lalita Mahal Palace is one of the 2 oldest lifts in India and also its very well maintained. It looks very quaint. There is also a huge wooden elephant opposite the reception table. 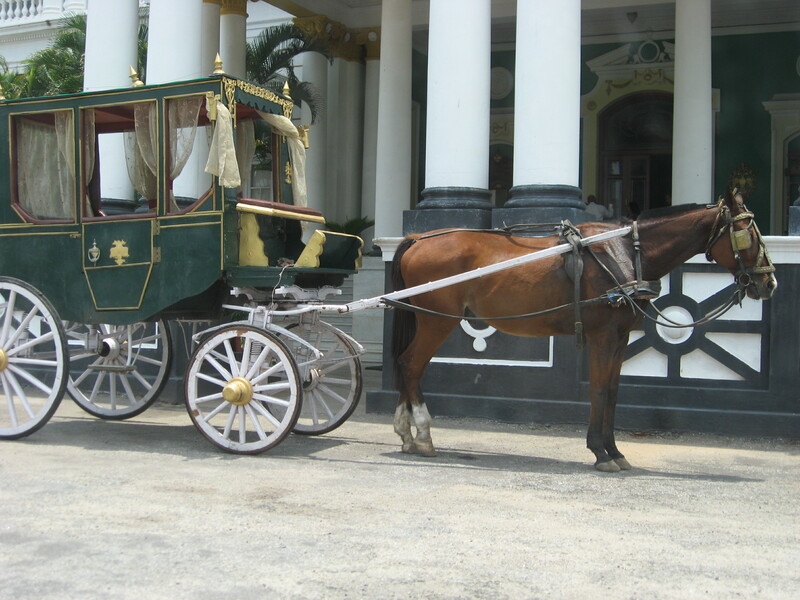 There is also a quaint horse carriage much like the victorian times.Once we went inside the first things we noticed or rather we were told to notice were the Raja Ravi Verma Paintings. The paintings are almost lifelike and these paintings seriously compete with the art in countries like Italy and France where Medieval Renaissance took the medium of Art and Paint. The ring and other accessories painted looked life like. There was also a banquet hall which had an air of the old times. You could actually imagine the old times when the queen held balls there and people were dancing on the floor. (=dreaming dreaming). Also much to our delight, there was one person cleaning one of the rooms. We really wanted to see the rooms and how it would be to see a super deluxe suite. And we did get our wish. The beds looked so beautiful and the bathroom was so grand. I would really like to stay one night here in the room and play the role of a queen. We had to quickly see the room and leave else the worker would get into trouble. Near the staircase, there were 2 stuffed animals, one of a tiger and one of a lion. There was also a long grandfather clock. Imagine the old times when the queen must have roamed with her servants!! !When we were coming out, we were told that there was an ex-minister of Karnataka state who was coming and we saw him getting a ride in the Victorian Carriage. Luck man, be a minister and get to sit in carriages and rest on fancy beds!! This was followed by lunch and a trip to the Mysore Palace. Which continues in the next note. 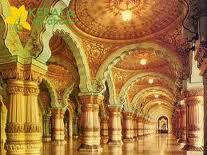 Next Episode: Mysore Palace, Cyberworld Meets Real World!!! 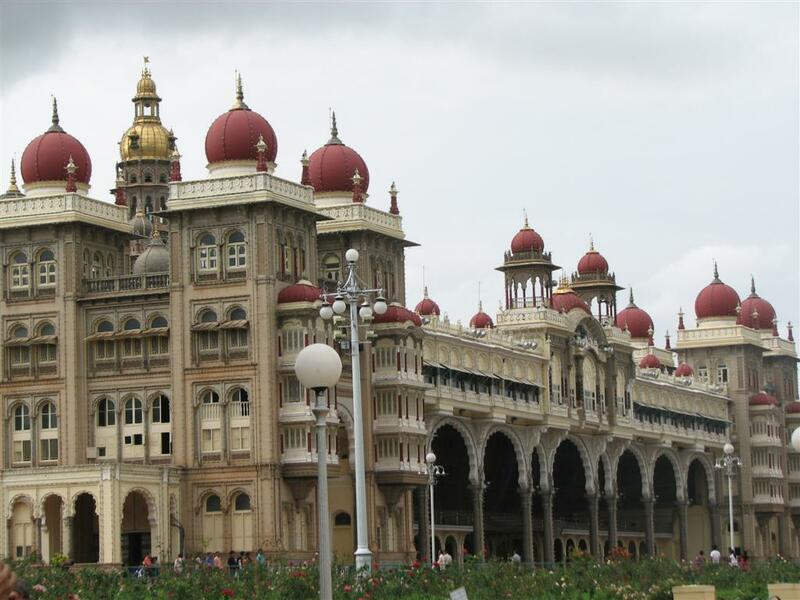 Author NMPosted on March 6, 2012 March 9, 2012 Categories Karnataka Road TripTags Beauty, Carriage, Explore, Fun, India, Karnataka, Lalita Mahal, Lift, Mysore, Palace, Raja, Raja Ravi Verma, Regal, Road Trip, Royal, Victorian, Writing1 Comment on Exploring Mysore-A trip in the colonial times. 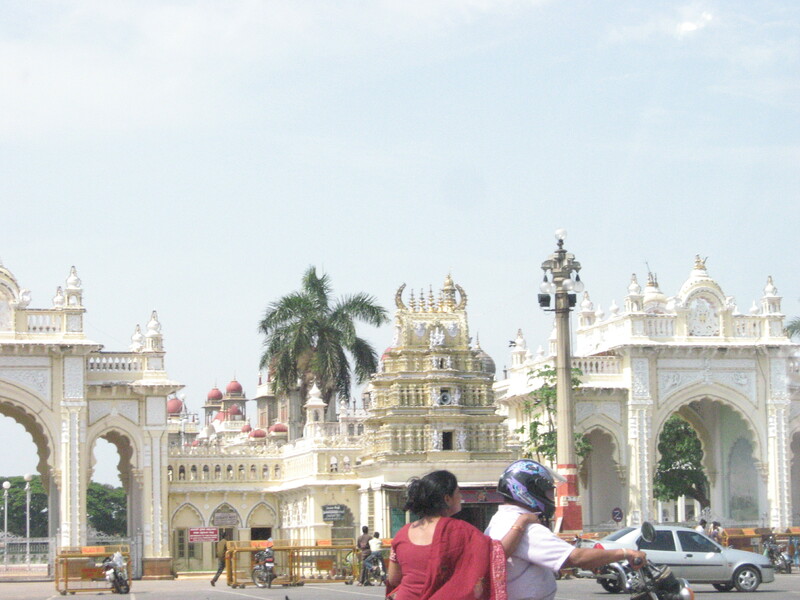 Mysore was like a breath of fresh air for us. We’d not expected Mysore to be how it was.For us Mumbaikars, we’re used to polluted, congested areas and absurd traffic with horrendous roads. 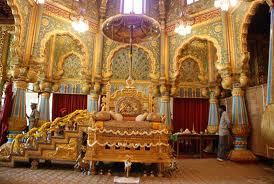 Mysore is called the ‘City of Palaces’ and so true. At every corner we could see palaces which were used as offices for the Municipality or as hospitals and they were maintained superbly. 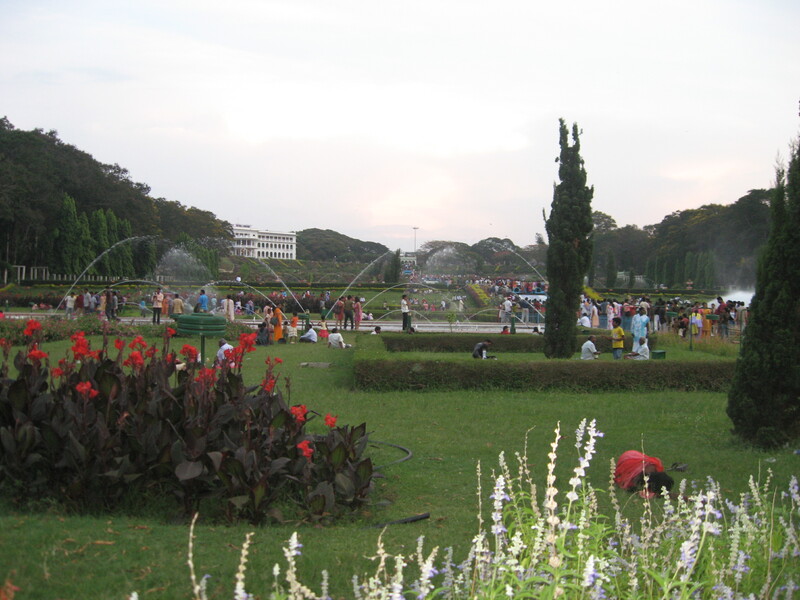 Also Mysore is a small city so navigation was not difficult (=not taking credit from the planners, its amazingly well planned with lots of trees). 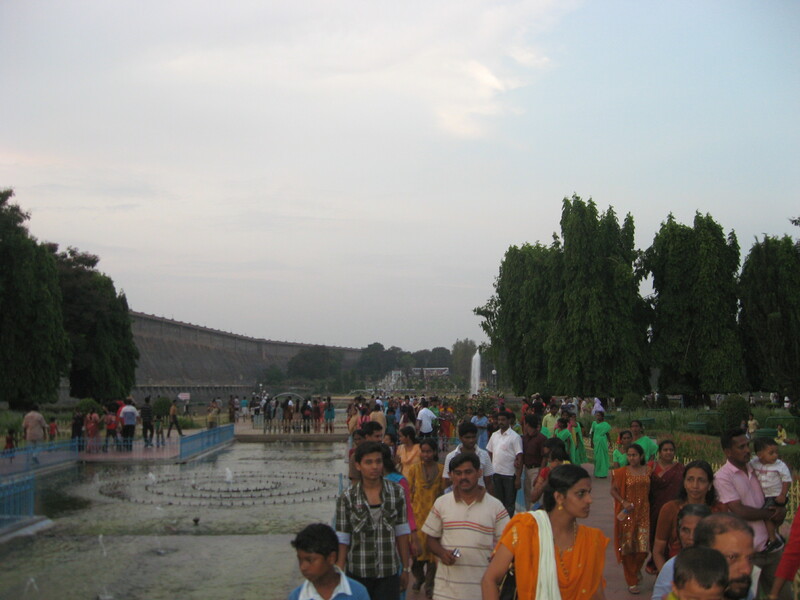 After the rest at the hotel and some snacks, we set out to the Vrindavan Gardens which is built on the sides of the Krishnasagar Dam. 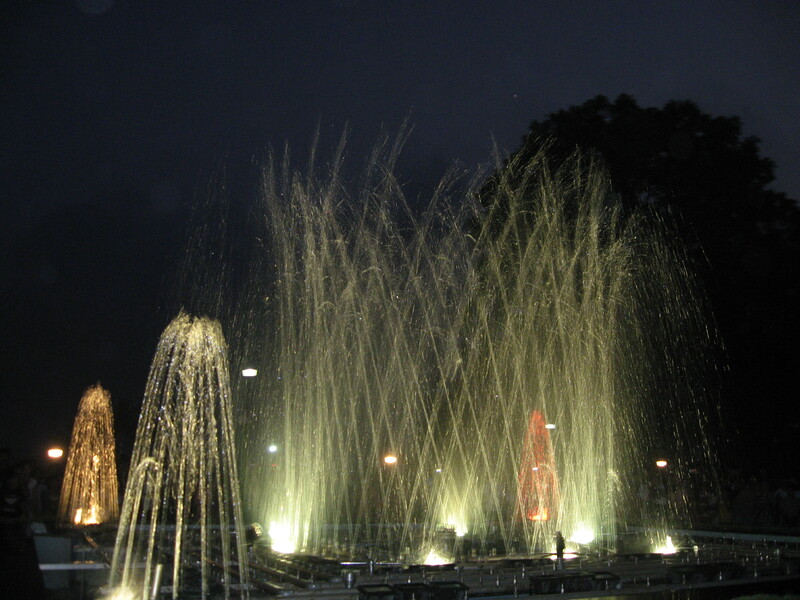 It is also famous for its Magical Dancing fountains which dance when a song is played (=kind of like what we had seen in Madikeri except on a larger scale). There was a lot of rush in and around the gardens. Plus it was a weekend and they only have the fountain show on weekends. So the greater crowds. Also there was this real funny scene which happened when we were going. 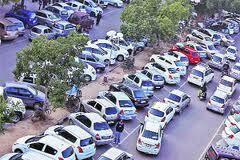 My dad was parking the car and at the same time there was a Santro who was parking in the lane where i was standing. Now this car had 3 ppl who were sitting in it,1 sitting behind. And while reversing, the guy sitting behind didn’t even look out to see where the car was going and they crashed into the steps. And the person sitting in front was giving me a look as if i should have warned when i was not paying attention to them. It was so funny. 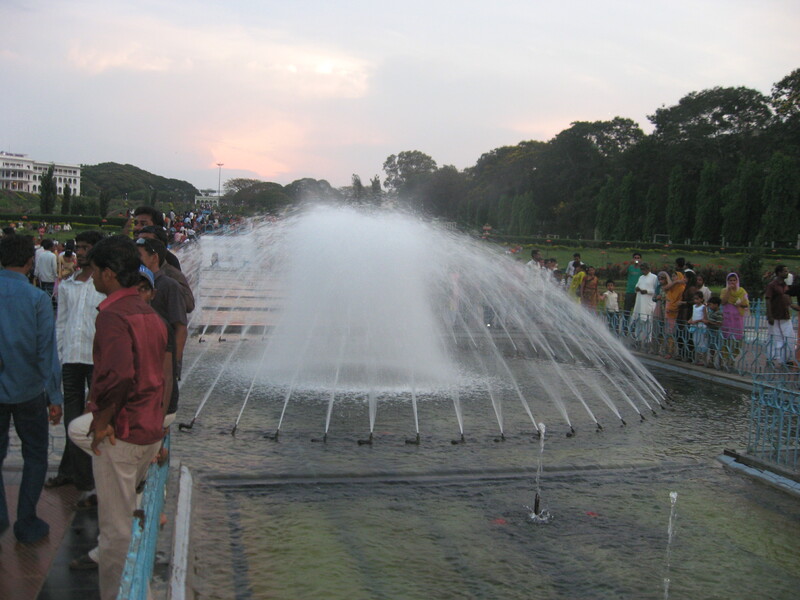 The Vrindavan Gardens play the musical fountains only on weekends which draws in a lot of crowd. At about 5:30 when we entered there were about 5000-10000 people in the garden, roaming and going to the place where the fountains were located. I’d never seen such a crowd before. This was really huge. In college festivals and other events, we often exaggerate the footfalls but here i actually experienced what it was like to be in a crowded place (believe me the Mumbai crowds are nothing compared to the crowds here). The garden is beautifully maintained, whatever little we saw of it. Everywhere we looked we could only see people. The garden has different levels and is divided into 2 halves by a stream of water. 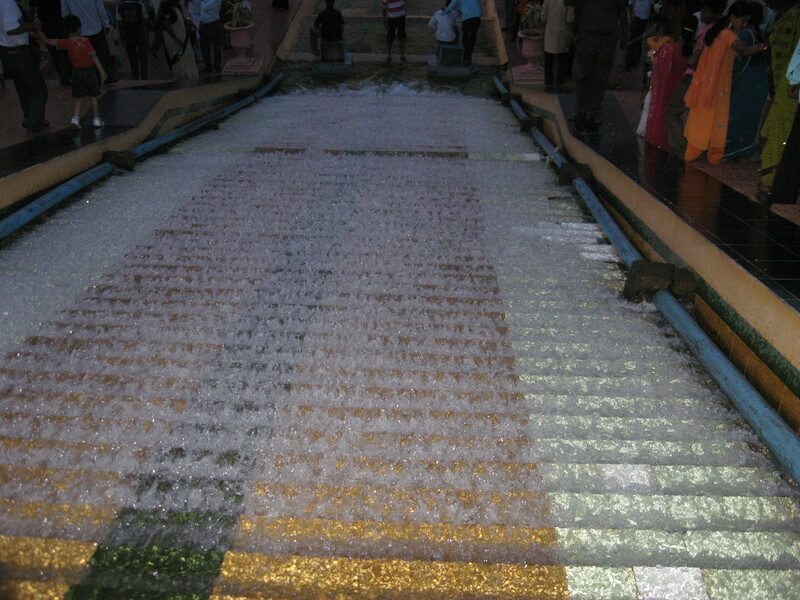 Near the steps, the water flows like a waterfall. Its beautiful. Plus the water was always spraying off and if you got close by then you could get wet. But this made the weather very pleasant. There wasn’t much we could do because there were so many people and we couldn’t risk getting lost. We asked one of the guards directions to the musical fountains and got a picture clicked with him. The light was fading fast. We learnt from the guard that even though walking on the dam is very scenic but they had to stop it after a string of suicides. The top of the dam had pretty lamps with intricate carvings. 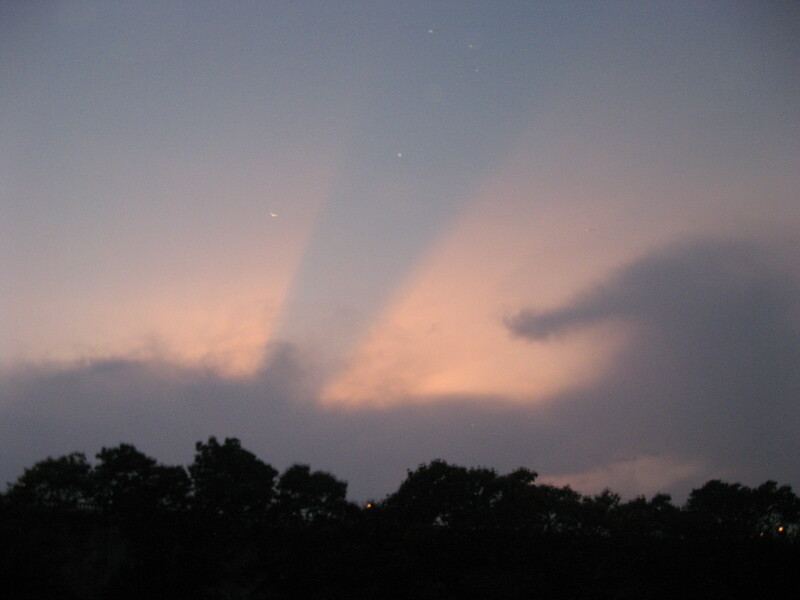 The sky was darkening and there were lot of nice patterns. We slowly made our way towards the food stalls. All of us had sugarcane juice (=nothing like ganna juice to refresh you) and Sachi had a mango milkshake. 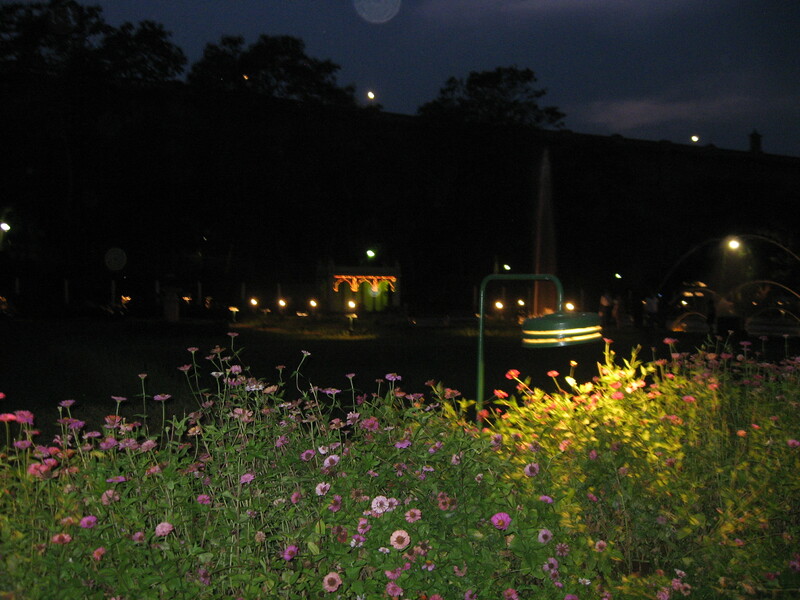 After that we had some gobhi manchurian and then made our way to the fountains. There is a bridge which connects the fountains and the main gardens. The water there was very dirty with a lot of garbage in it, I don’t understand people’s mentalities when they throw garbage here and not anywhere at their houses or in foreign countries. Simply infuriating. Through the crowd, we made our way, through some more poorly maintained gardens and through a maze of people. It was like we didn’t have to walk, we were simply pushed there. We could hear music coming from somewhere and we walked in the direction of the sound. 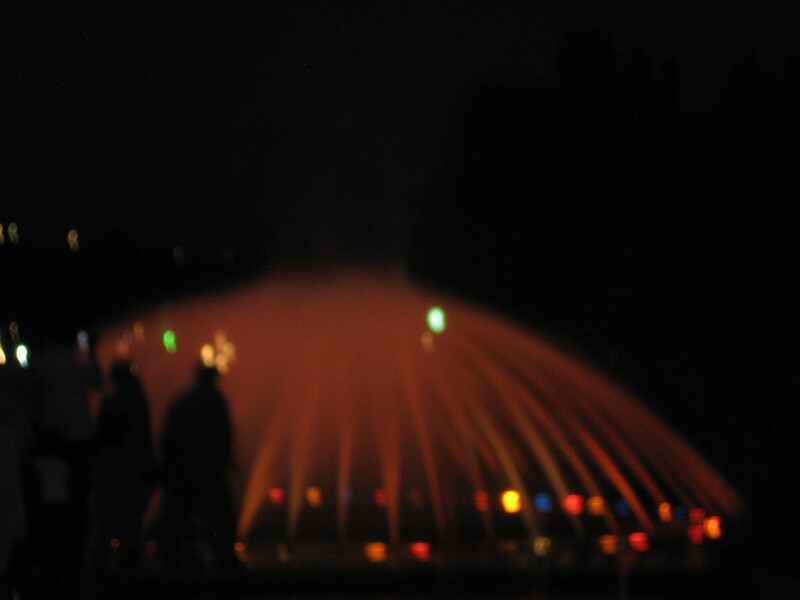 and then we saw the fountains. Huge and swirling, these were big. There was an amphitheatre where ppl were sitting and watching the spectacle. 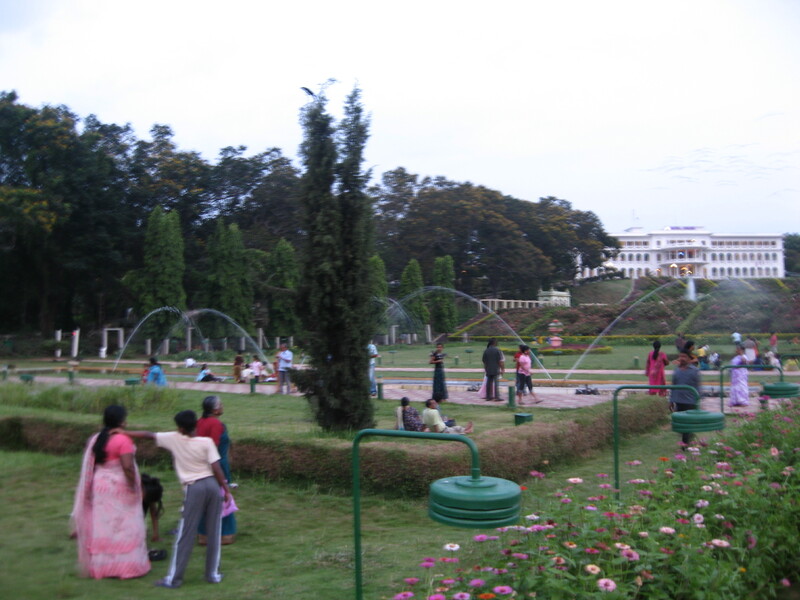 Since we’d seen the fountains at Madikeri with a lot lesser crowd, we were not spectacularly impressed. Although some of the swirls were fabulous the rest was pretty ordinary, I guess the law of diminishing marginal utility played its role. Once the crowd lessened, we went and sat on the seats they had made. Since it was windy that day, the fountain was tilted because of the wind. Each song plays for 15 mins with a 5 min break ad they play 6 songs in total, So even if you’re late, you still get to watch it. After watching 2 songs, we left. We had to leave from a different route. This was a route through a canopy of trees. During this time we witnessed a super spectacle, lightning in the sky. I’ve never seen flashes of lightning before like this, we were so stunned. Bright red copper streaks in the sky!! It was sheer delight. We just paused and watched, waiting for more. This time it was easier crossing the bridge as there were fewer people. There were also ppl throwing garbage into the water which struck me as being immensely immature. We even reprimanded 2 girls. There was 1 guy who tried to defend them but his arguments lost steam. We got into the car and left for our hotel. The sky was lit up by the occasional flashes of lightning and the winds indicated rain that night. The drive back was uneventful. We decided to have dinner at a Pizza Place and had delicious pizza. We even saw the person make the pizza. It was great fun. We were tired and slept soundly. 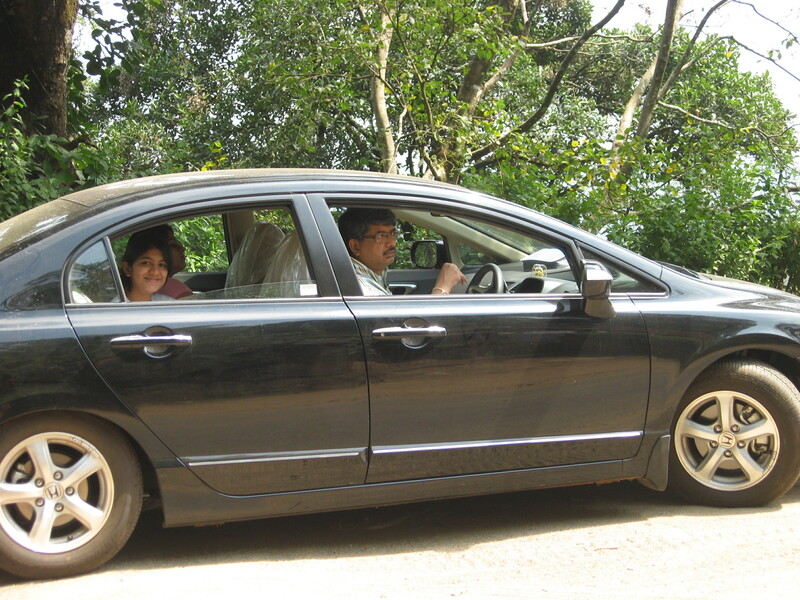 On this day, we checked out of Club Mahindra Kodagu Valley and proceeded to our next destination, Mysore. We would miss the ‘Scotland of the East’. When you really see the diversity in landscape and foliage and wildlife here and in Scotland, you’d never want to see Scotland. Sure they have the lochs(=lakes) but apart from that, its nothing spectacular. There was never the chirp of insects, the smell of flowers, the hustle of people that you find here. Rather we should be saying that Scotland is the ‘Coorg of the West’. After checking out and stuffing all our luggage in the car (believe me, it wasn’t an easy task) we proceeded. 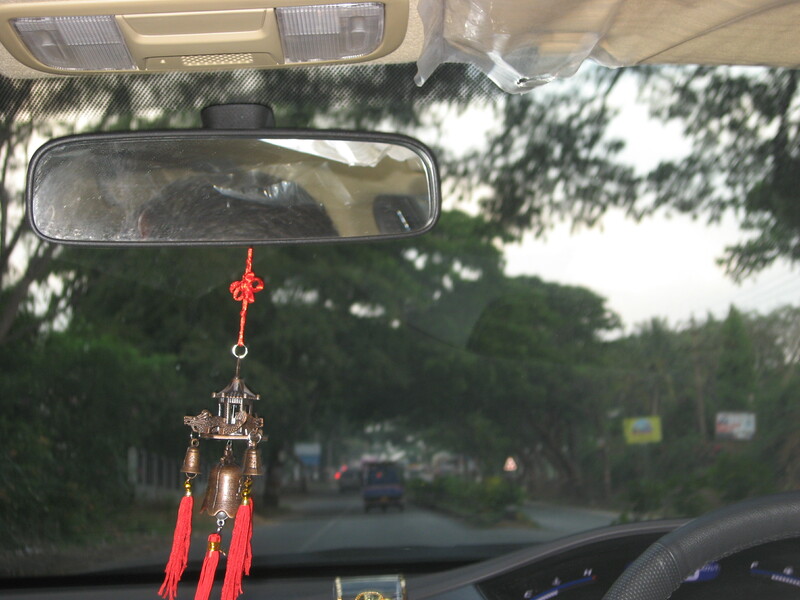 Now that we’d been in the market often, i could distinguish the roads. After filling up the Civi with petrol, we drove on. 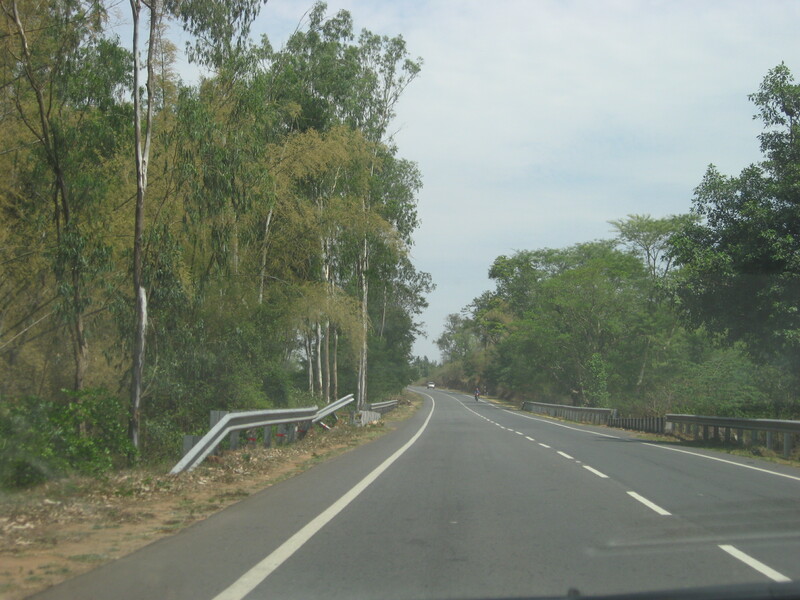 Like i’d mentioned earlier, the road to Mysore was under construction so we had to go via Dubare. We passed the Tata Coffee estate and a small village on the way. The most fascinating thing about this road trip is that people from all the villages know where the road leads to and how to reach different villages, towns and cities. The depth of their knowledge is amazing. 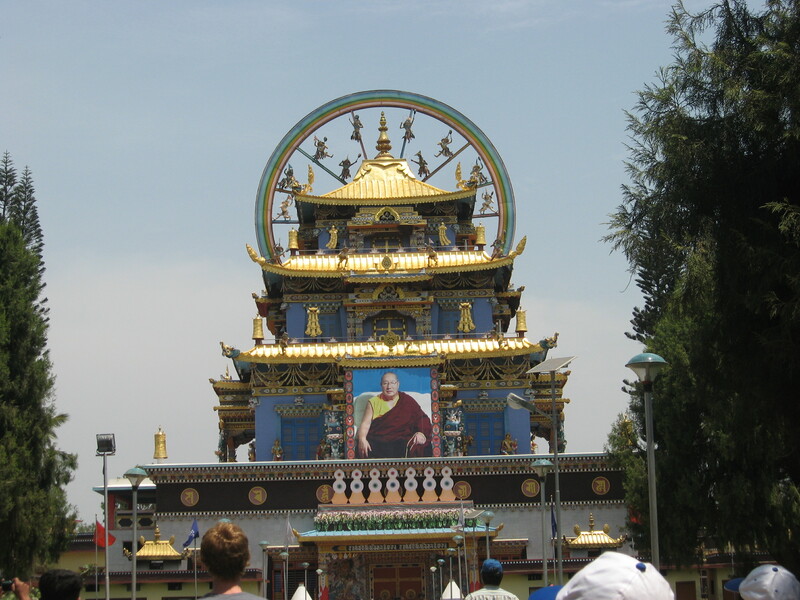 Destination 1: Namdroling Golden Temple. 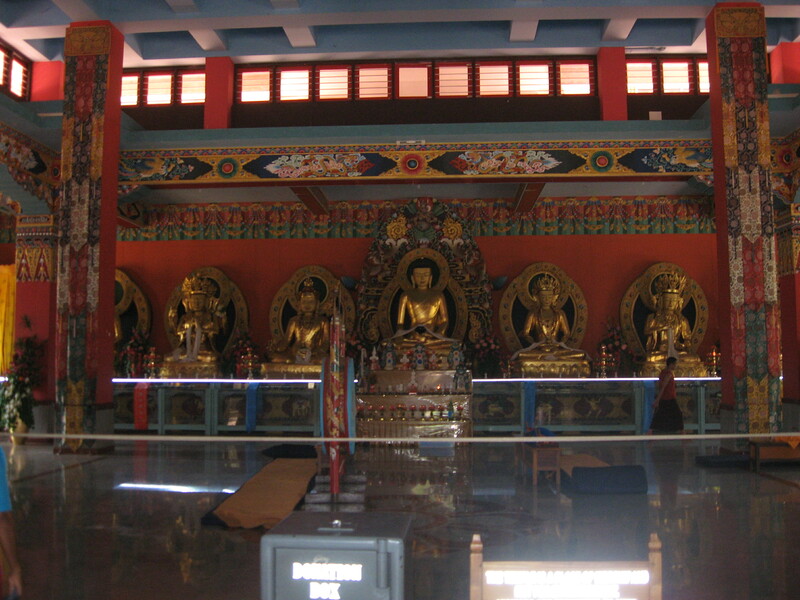 This is a Buddhist Monastry, College and Hostel where the idols of the gurus are in gold. Its a beautiful and peaceful place. A must visit. 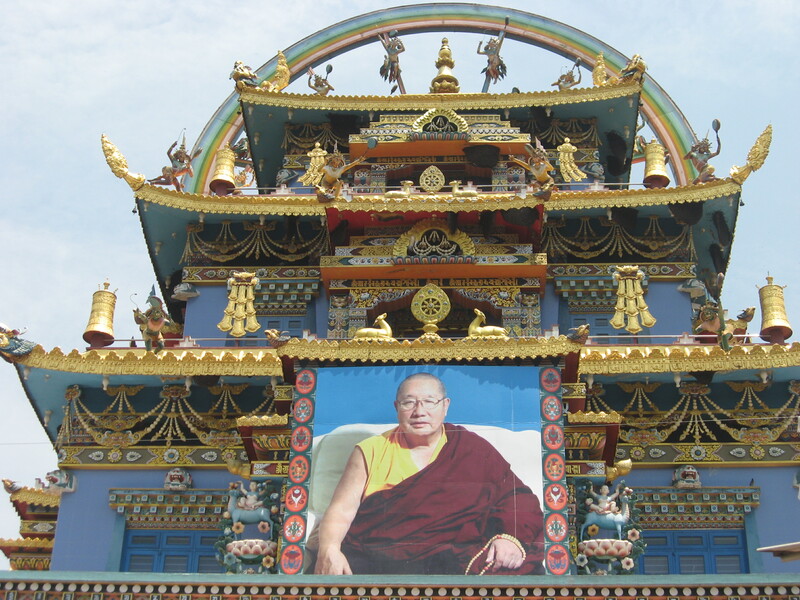 The approach road to the Monastry was lined with different flags and there are adequate signs showing directions to the place. I think our culture has only stood to gain from helping out the tibetans. Of course they are a fiercely independent group but a very peaceful one at the same time. After parking our car, we made our way inside the Monastry. I think the tibetans are tremendously grateful to Indians and i’ve never heard of any conflict between the Indians and Tibetans. 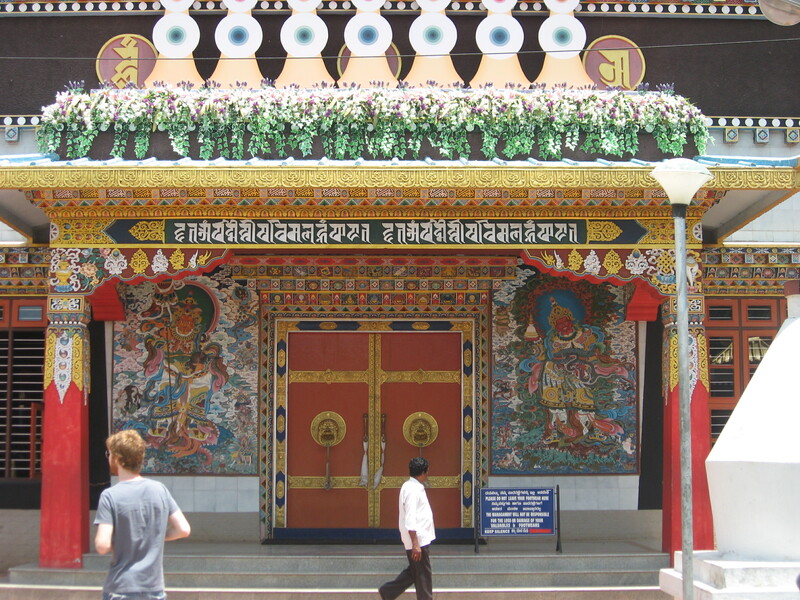 When we entered, there were some old tibetan ladies sitting wearing colourful quilts. I always find old people very cute but i find tibetan ladies cuter coz of their wrinkles!! The temples that we saw when we entered were amazing. They are so intricately carved and so well painted. The picture below shows the first temple we saw when we entered. there were geese in the gardens that were playing with water when we came. It was very sunny that day and it was extremely hot. But it was fun to see the temples. 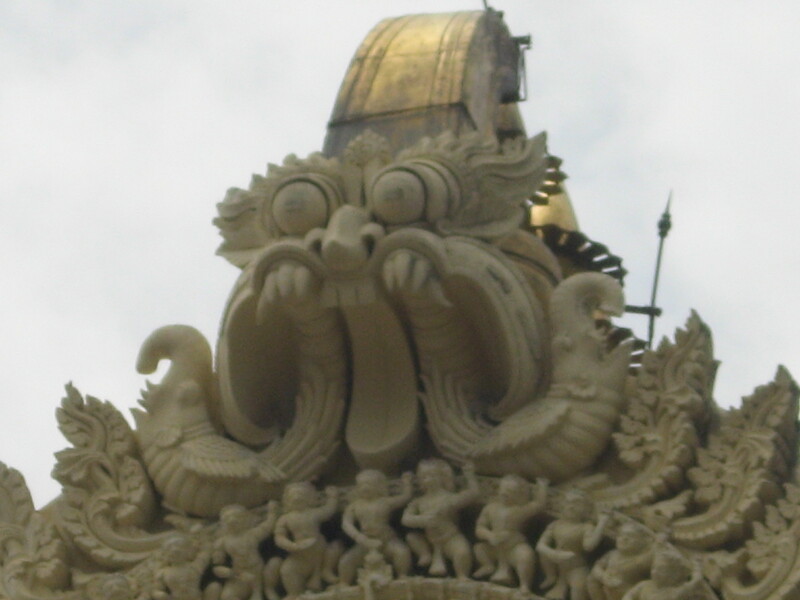 Most of the temples have 2 demons painted outside. One which welcomes luck,laughter and all positive energies and the other fierce devil which keeps out all the bad and negative energies. Tibetan script looks a lot like bengali. 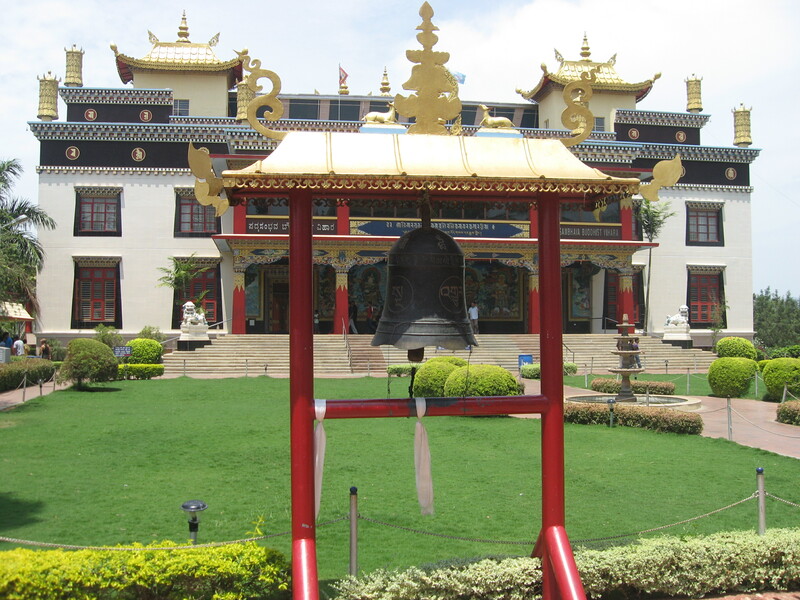 Plus there are big bells outside every temple with intricate carvings on it too. 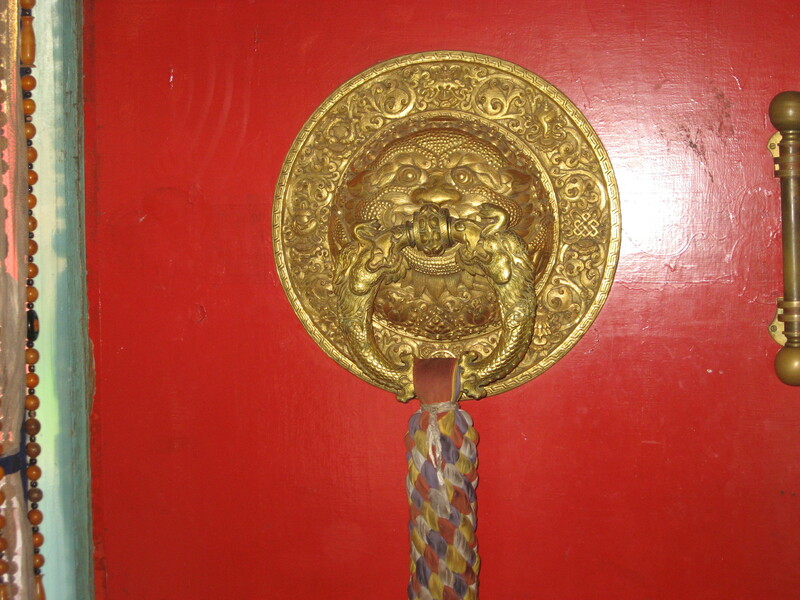 The main temple had a huge and heavy door with a very thick mesh of ribbons tied to the knocker. 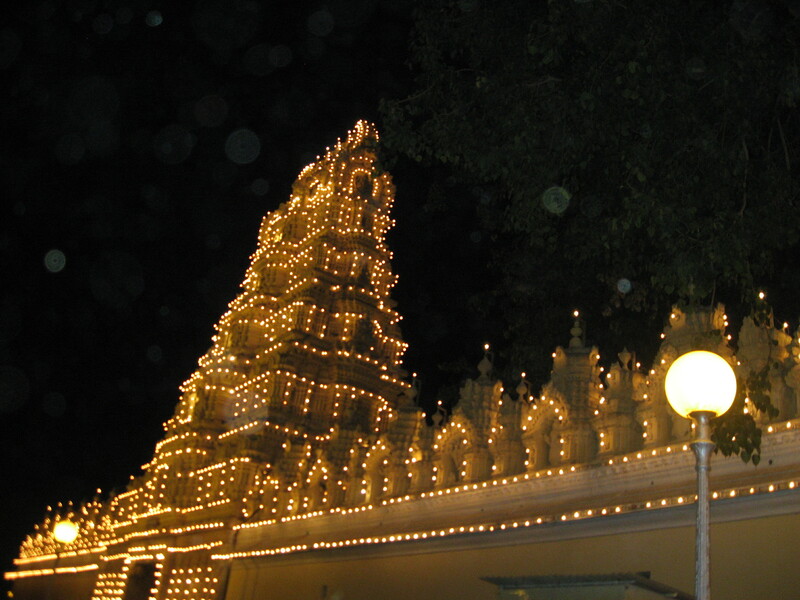 This main temple had 3 idols, which were made of gold. Actually legend goes that they are made of clay and have ancient scripts and treasures inside and the gold is a way to protect that. 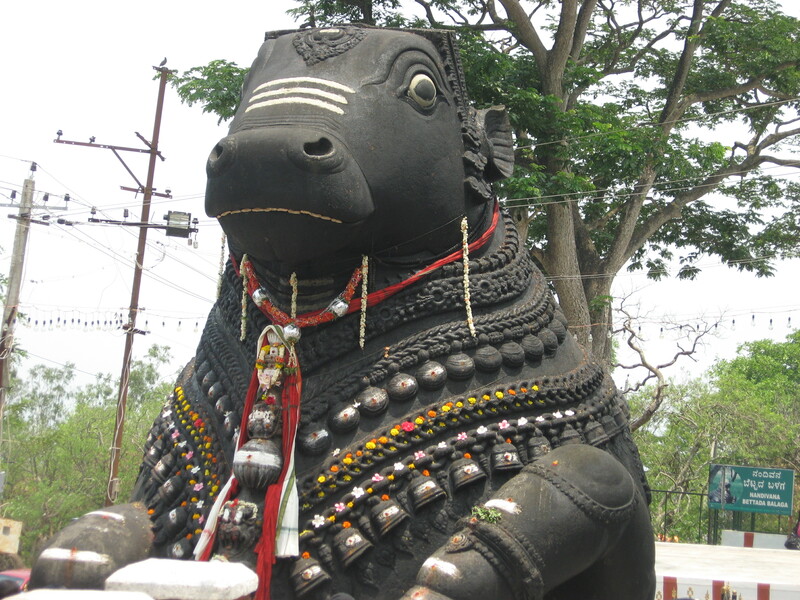 Each idol sits in a meditative pose and in an intricately done frame. The wall behind the idol is painted exquisitely with angels on clouds and other heavenly bodies. The pillars are adorned with dragons for in their culture as in chinese beliefs, the dragon keeps the bad out and lets prosperity in. 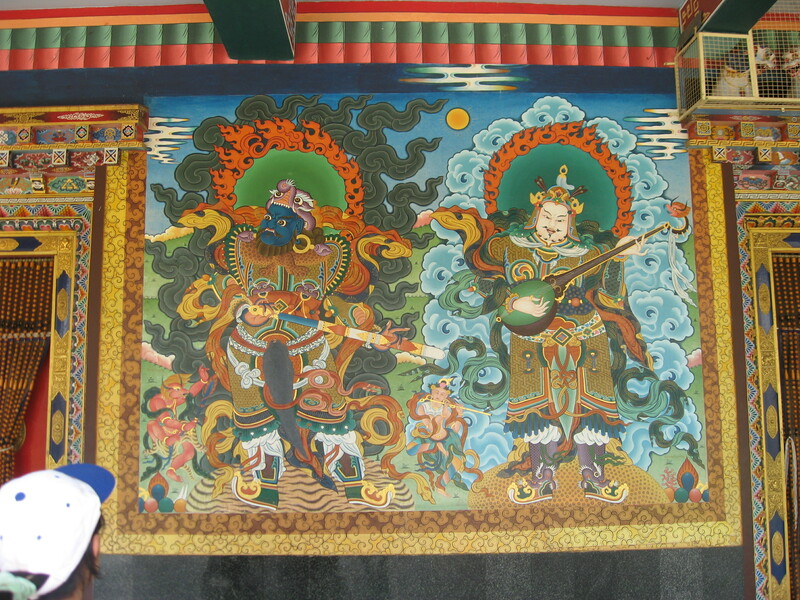 There were also intricate wall paintings, which indicate the 25 disciples of Guru Padmasanbhava, one of the biggest gurus. 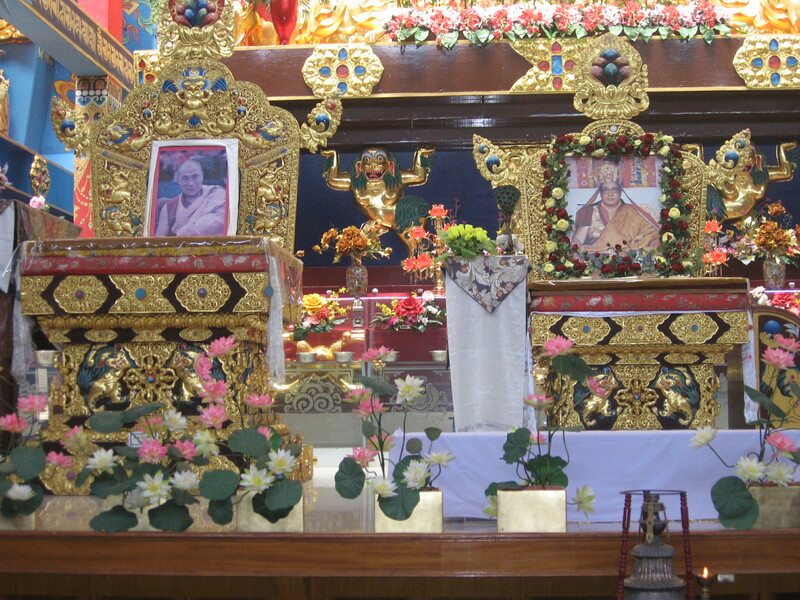 The 3 idols were Guru Rinpoche,Guru Padmasambhava and Guru Amitayus. 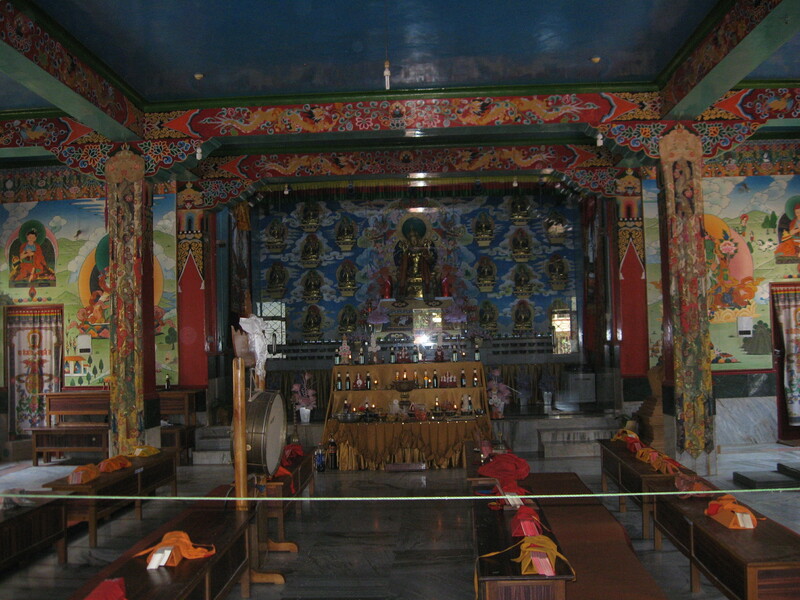 There were boards with written material regarding the idols and the wall paintings. It was a fascinating insight into their culture. The temple was so peaceful. There were positive vibrations everywhere. Also there were a lot of sparrows flying everywhere. I’ve noticed that in peaceful places like temples, there are a lot of sparrows flying around. We sat around for a little while and meditated. After that we explored the temple area. It was nice to see that the landscaping had been done so well. There were plants from Malaysia and other exotic work like fountains done up. After that we went to another small temple. we had to be careful and jump about a lot because the temple complex had heated up quite a lot. The second temple had the ancient scripts which the monks read from when they prayed. 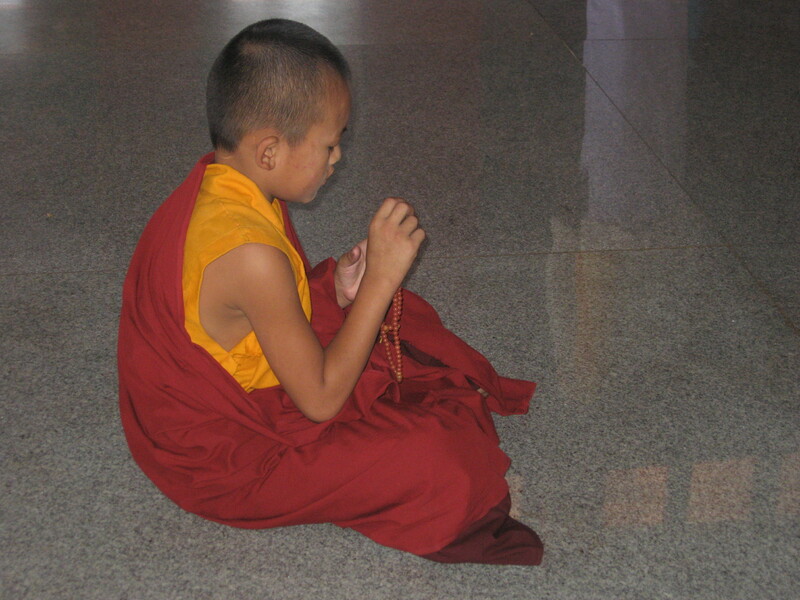 In the third temple there was a small monk who was praying with a rosary, it was so cute. Everyone was taking pictures of him. In this 3rd temple there were 6 idols who all had their eyes closed and were meditating. This temple was the one which we saw when we first entered into the Monastry. After the Monastry, we decided to have lunch at one of the tibetan restaurants. 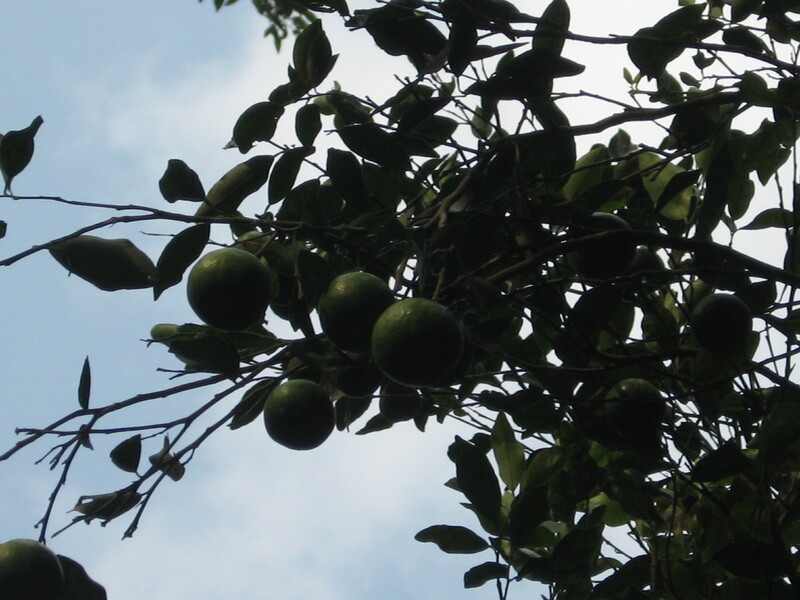 Before that, we got some jackfruits from the local vendors and then made our way to the tibetan market. These are tibetan co-operative stores so they all sell their wares at the same price. 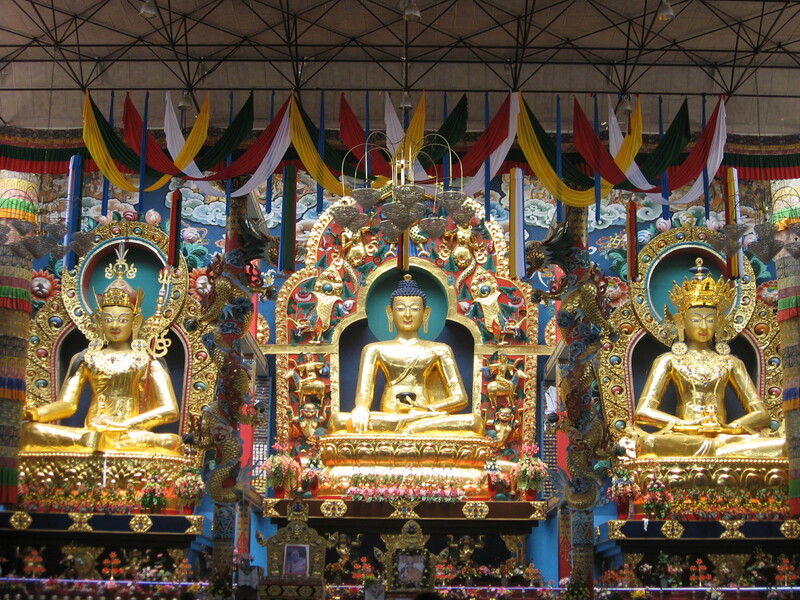 Even though we may not believe in charms and stuff, these tibetan things made us belive in them. We got some nice key chains, some good luck charms for cars and a bell called the ‘Om bell’ if you run a wooden stick around its circumference then the vibrations grow louder and sound like ‘Om’. It says it spreads positive energy around. And then we set off for mysore. The road from here on was smooth. We were no longer on the hills but had come down to the plains and it was evident from the difference in landscape and vegetation. After being allotted our rooms, we had some refreshments and then chilled out. 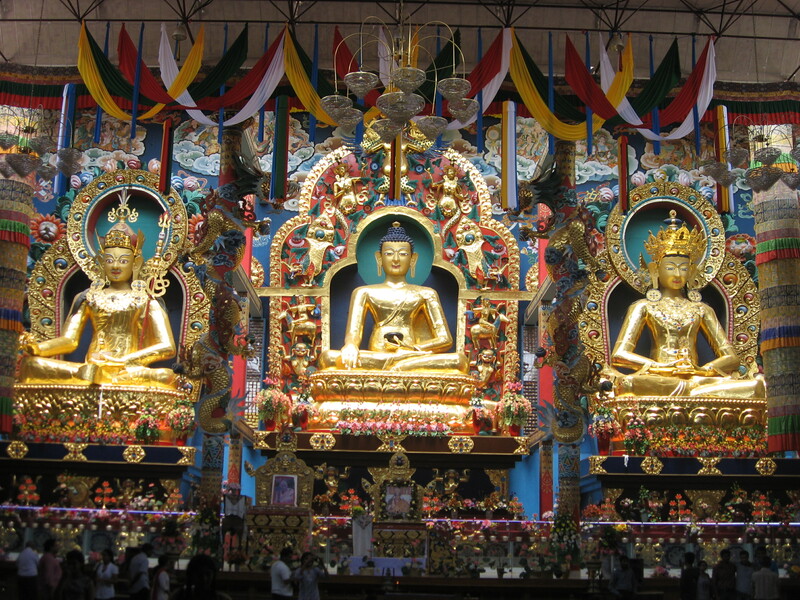 Author NMPosted on March 3, 2012 Categories Karnataka Road TripTags Ancient, approach road, Beautiful, Buddhism, buddhist monastry, Calming, Chants, Club Mahindra, Coorg, Gods, Gold, idols, India, Intricate, Karnataka, kodagu, Momos, Monks, Mysore, Namdroling Monastry, Paintings, Peace, Peaceful, Road Trip, Silence, Thupka, Tibet, Travel, vacation, WonderLeave a comment on Coorgi Tales-Goodbye Coorg! !